The other day I realized that Hollywood award season is almost the only time of year that my wife and I see movies outside of the house. And when we see movies, we see a lot of them. Like, a whole year’s worth in two or three months. Then we’re burnt out and don’t see anything on a big screen again until summer. Thank God for Redbox! A few weeks back, Mrs. Yeti and I went to a screening of Argo and it was incredible. The acting, writing and directing was all first-rate and not only was the whole movie edge-of-your-seat thrilling, but it was also funny as hell, even if you don’t get all the insider Hollywood jokes. So, it’s definitely worth checking out, especially if you like to see all the possible Oscar nominees — judging by the reaction so far, Argo is sure to snare a Best Picture nod — before they get nominated. That said, the movie I want to talk about today is Cloud Atlas. My brother and I went to a screening of Atlas the other night and, despite a few flaws, we loved it. Actually, I think the flaws made me like it even more because they highlighted the colossal effort it took to make something this bold. I don’t want to go into too much detail about the plot, but, as you’ve no doubt seen from the trailer, the movie is as big and epic as Hollywood movies get these days. The acting is great, the writing and cinematography is gorgeous but the real star of the movie is the theme. Much of the pre-release chatter about Atlas has focused on the fact that Tom Hanks, Halle Berry, Jim Broadbent, Hugh Grant and the rest of the cast play multiple parts in multiple time periods, which is cool, but, the message at the heart of the movie is much more interesting. The movie theorizes that everything is connected, love, hate, good, evil, life, death, every single thing we do in our lifetimes touches someone else’s life in ways we could never imagine. I know what you’re thinking: great, an essay about life from the creators of The Matrix Trilogy and the guy who directed Run Lola Run. Well, in a way that’s kinda true. The movie is an essay, or, a love letter if you will, about the eternal, transcendent power of love. I know that sounds corny and mildly student-film-ish and maybe it is a little of both. I mean, honestly, there is a lot going on in this movie, and it does require a bit of patience on the part of the viewer. Hell, up until the half-hour mark, my brother and I were so confused and annoyed that we were ready to bolt. But then something happened — it was a different scene for both of us — that changed everything and from then on, we were caught up in the whole crazy-beautiful, time-tripping swirl of it all. I don’t want to ruin the experience for you guys, so, I’ll stop gushing about it for now, but, if you’re on the market for a deep, heartfelt, truly original movie about ideas and emotions and the power of human connection, then this is the date night movie for you. 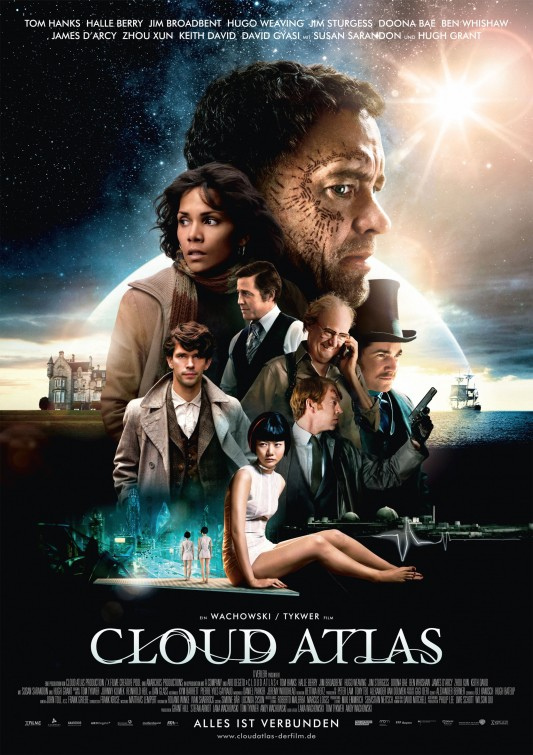 As I said before, it might not be for everyone, as it is a little weird and challenging in spots, but, man, if you’re up for a little three-hour, mind-bending adventure, Cloud Atlas will rock your world! Oh, and make sure you budget in some post-movie chat time afterwards because this is definitely a movie you’ll want to discuss. My brother and I have been dissecting it for two weeks now and our heads are still swimming!